If your bustmeasurements are smaller then your waist measurements, we recommend to wear a push-up bra or maximizer, elseway it could be that the fit is not perfect. The bodice is boned to ensure it will not sag. Your waistmeasurements determine the right size! Limited collection! 1950s reproduction navy sateen spot circle dress. Polka dots have been a firm favourite with girls for well over 100 years. Perhaps it's because they are so versatile, in a spotty frock you can be anything from a ravishing rockabilly chick to a demure fifties poppet, and everything in between! 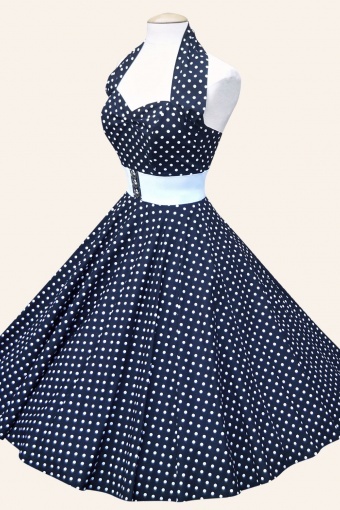 Our 1950s style polka dot swing dresses are beloved by everyone from vintage and burlesque girls to curvy celebrities like Charlotte Church and Nigella Lawson... they get more column inches than any of our other styles! We're sure it's got rather a lot to do with the wonderfuly flattering cut, thanks to the boned bodice, tightly nipped waist and full circle skirt that combine to create a killer hourglass silhouette that supports, cinches and disguises in all the right places. With such a wide array of colours on offer, we're surprised you've resisted long enough to read this far...! Accessories NOT included (petticoats, flowers, belts) We are totally committed to quality. Our polka dot retro circle dresses are made from 100% crisp cotton and easy-care cotton sateen fabrics, and everything is created in London. Ik ben super blij met mijn mooie jurk! De maat klopt precies en hij kleedt heel mooi af. De kleur is wel wat donkerder dan op de foto, bijna tegen zwart aan. Bedankt voor de goede service, ik ga zeker vaker bestellen!